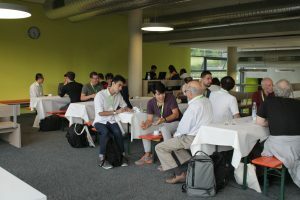 Knowledge transfer at a very high scientific level: the Digital Landscape Architecture Conference 2018 at Weihenstephan-Triesdorf (HSWT) hosted 130 participants from 22 countries from May 30th to June 2nd discussing the latest research and applications of information technology in landscape architecture. 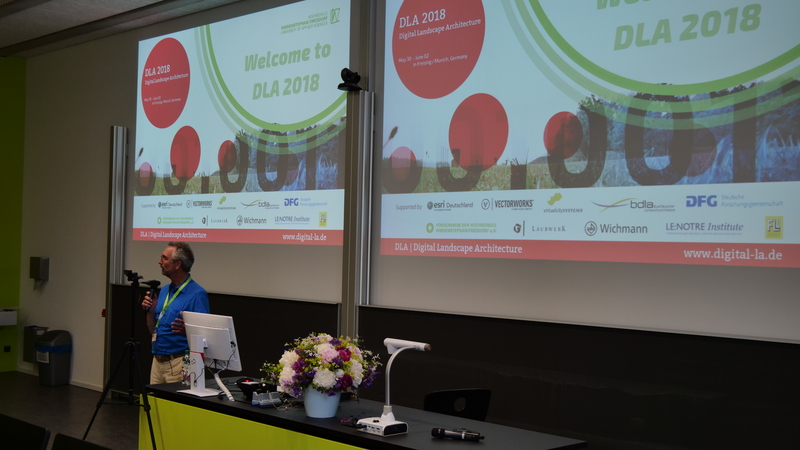 At the same time, the conference honored 30 years of landscape informatics through Prof. Dr. Ulrich Kias. 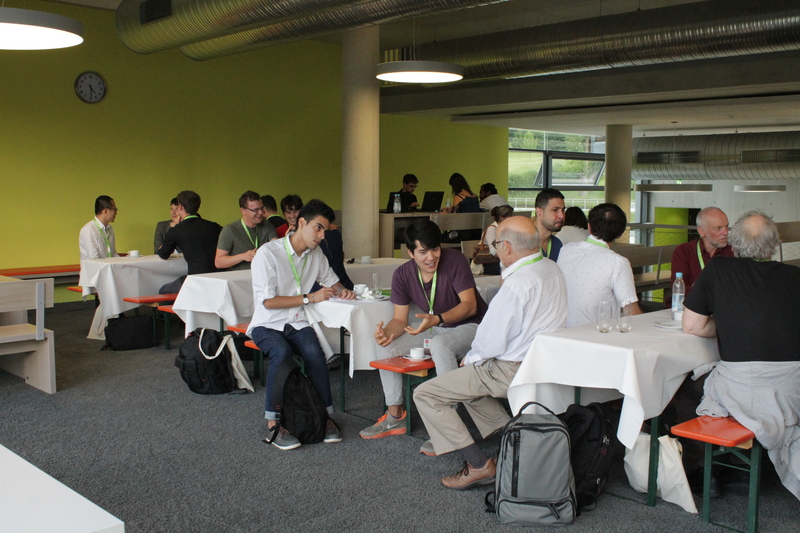 The conference started with a geodesign workshop run by Harvard professor Carl Steinitz and his colleague Olaf Schroth at HSWT, since 2017 professor of geodesign and landscape informatics at HSWT. In the workshop, six stakeholder groups developed and negotiated different scenarios for the area between Olympic Park and city´s edge in the north of Munich. The workshop was facilitated through the open online platform geodesignhub. Other international scientists and practitioners, who gave key notes, were Prof. Joan Nassauer, University of Michigan, Prof. Kelleann Foster, Pennsylvania State University, Prof. Stephan Sheppard, University of British Columbia and Mike Shilton of the Landscape Institute in England. The public talk by Dr. Jörg Rekittke, addressing the “Challenges and approaches of landscape research and design in the global south”, was also highly appreciated by the audience. In addition to key notes, the various lecture sessions addressed the themes geodesign and climate change, big data in landscape architecture, Building Information Models (BIM), drones/UAVs for data survey, social media and VR/AR. Various speakers demonstrated the latest developments and applications in practice examples such as the use of high resolution laserscanning data and digital terrain models, the use of environmental sensors and VR/AR displays. 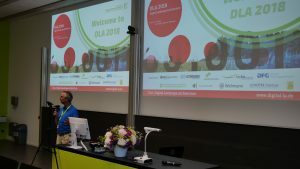 If you are now interested, the next DLA conference will take place in Dessau in 2019 and celebrate the 20th anniversary of the conference series and in 2020, the well-established Harvard Graduate Design School will host the 21st DLA. For more information please see the conference website at dla.hswt.de. The drone in the photo is not related to the research article below but our own drone. Urban green space (UGS), which plays an important role in reducing the problems associated with urbanization, needs to be evaluated by metrics. Three-dimension green quantity (3DGQ), a quantitative index that measures the crown space occupied by a growing plant, is often used to evaluate the extent, and the environmental and climatic benefits of UGS. The objective of this study was to measure the 3DGQ of Paotaiwan Wetland Park (PWP) in Shanghai, China. Implementation of the 3DGQ index was supported by remote sensing (RS) images taken by an unmanned aerial vehicle (UAV). The 3DGQ calculations for 100 species of trees were used to calculate the 3DGQ of the UGS in PWP. The environmental and climatic benefits of UGS in PWP were also evaluated. The 3DGQ for the whole PWP was 668,624.13 m3. The mixed woods in the PWP annually absorbed 1,635.57 t CO2, 2.03 kg SO2, 735.48 t dust, and 2,254.49 t of O2. There was 367.74 t of diurnal transpiration. The lowered temperature of the PWP in the transpiration scope at 100 m altitude was 1.8 °C. 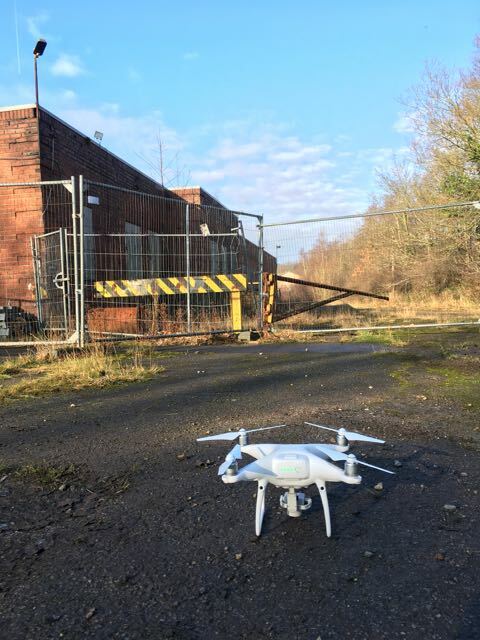 The use of a UAV to assess UGS could help planners and policy makers to improve the environmental and climatic benefits of UGS. This was my first time at one of the UK’s most important GIS conferences, GISRUK, and I was very impressed by the high level of the contributions. For landscape science, the ecology session was particularly interesting, e.g. Gullick et. al.’s (2017) presentation about tree risk evaluation. Other relevant sessions on remote sensing, VGI and visualisation. 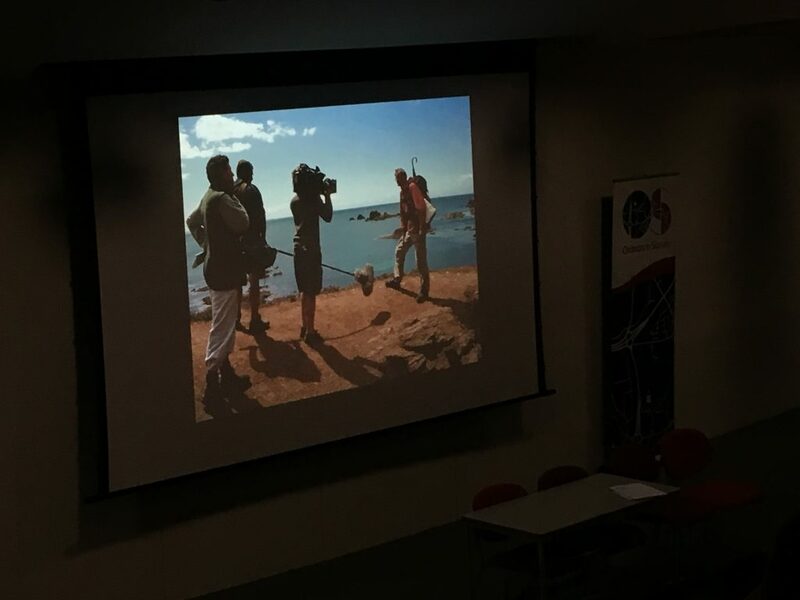 Between sessions, Prof. Andy Hudson-Smith from the Bartlett Centre for Advanced Spatial Analysis CASA and at the end of the conference, BBC2 presenter Nick Crane gave intriguing key notes. Last week, the Permanent European Conference on the Study of the Rural Landscape PECSRL conference 2016 took place in Innsbruck and Seefeld (Austria). It was my first time at PECSRL and I was impressed how well organised it was. It was also a very productive time because it had merged with the autumn meeting of a COST Action network I´m in. And last not least, I liked the basic PECSRL idea to host the first two days in an urban environment, then go on a field trip, and host the last two days out in the countryside. The presentations stood out through their great variety but most topics were not directly related to the theme of this blog. Except the presentation by Salak, Boris & Brandenburg, Christiane: Mixed method design as a supportive tool for evaluation of interactive 3D approaches to enhance objectification in wind energy planning processes in Session 5: Renewable energies in mountain landscapes: conflicts and synergies. 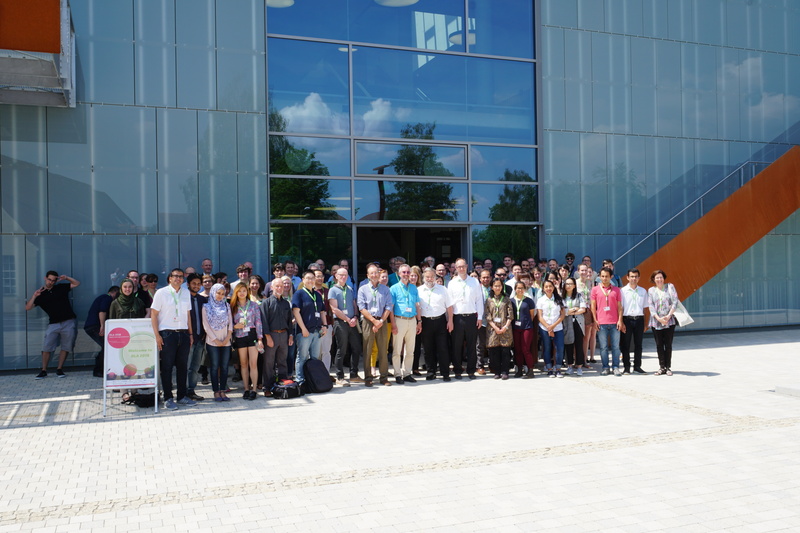 As part of the Windnet project, the authors and their colleagues organised expert workshops, survey and interviews with 27 wind energy relevant organisations. One part of the project addressed the use of visualizations in the workshops and the research question was: Is there a difference between the following three different visualisation techniques? The Chair of Planning of Landscape and Urban Systems at ETH Zürich has an opening in the area of GIS and remote sensing based landscape planning. The research group focuses on understanding how the interactions and/or actions of humans shape landscapes at various temporal and spatial scales. For fostering participatory landscape planning, they investigate how people perceive the landscape using state-of-the-art 3D visualizations of landscape changes and generate decision support tools. Particularly, they explore how an iterative process between design and science can allow co-creating place specific responses satisfying human needs and demands for well-being in a sustainable manner. to build a ecosystem services-based decision support system for planning urban green areas in mega-cities. For setting up such a spatially explicit decision support system, we are looking for a highly skilled and motivated candidate to work on the development of ecosystem services modeling approaches using as far as possible earth observation data in an urban environment. Ground truthing will be done in cooperation with ecologists. The candidate should have a Master’s degree in environmental sciences, ecology, geography, or applied geoinformatics with expertise in ecosystem science, remote sensing, natural resources management, and geospatial analysis. Skills in English scientific writing within the subject area will be given emphasis in the evaluation. Furthermore, strong communication, interpersonal and teamwork skills are needed, as there will be a strong collaboration with landscape architects, landscape ecologists, and water engineers in the frame of the project. The workplace will be at the Future Cities Lab in Singapore, a vibrant and highly innovative setting. The PhD will obtained from ETH Zurich. Please submit your application online (Apply now), which includes a comprehensive CV, cover letter, diplomas, work certificates, and contact information of at least two references and upload all documents (pdf is recommended) to ETH Zurich, Mrs. Corina Niescher, Human Resources, CH-8092 Zurich. The position will remain open until filled. 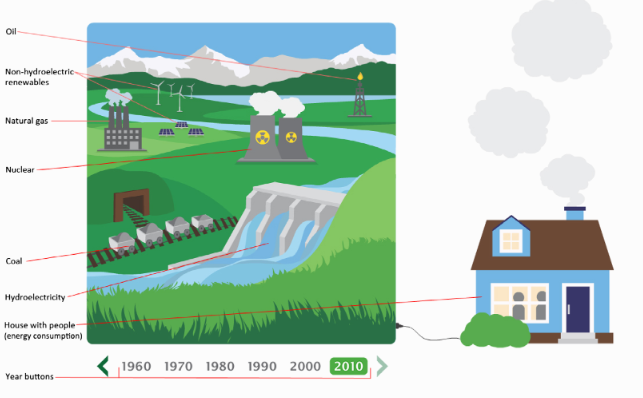 Labelled elements of an interactive visualization of secondary energy production and consumption in Canada from 1960 to 2010. In this newly published open source paper, Robert Newell, Ann Dale and Celia Winters at Royal Roads University in BC investigated the efficiency and effectiveness of interactive data visualisations in the commmunication of building energy production and consumption. Two visualizations were built that held contrasting features: an abstract, static visualization built in the form of a time-series graph and a dynamic, interactive visualization with a ‘picturesque’ design. 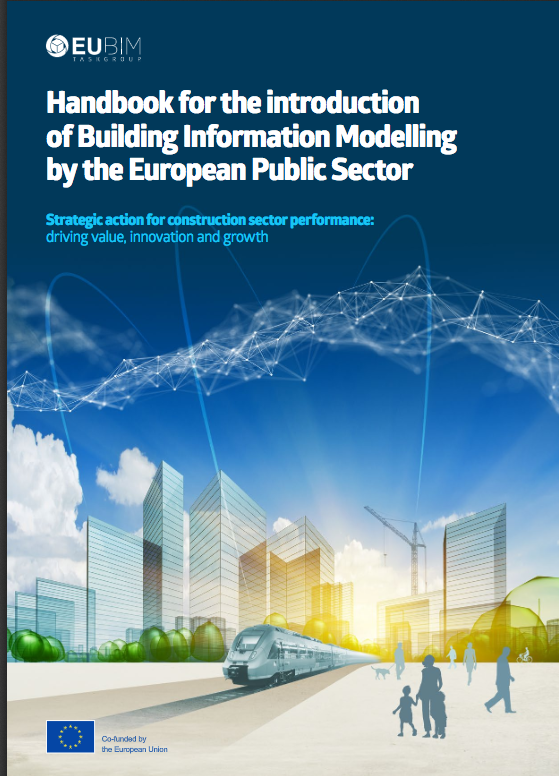 The results indicate that the interactive visualization held higher potential for drawing in and maintaining audience interests, whereas the static visualization was more useful for users wishing to gain a more detailed understanding of the data. These findings suggest that both types of visualizations have complementary strengths, and collaboration between trans-disciplinary research teams and graphic artists can lead to visualizations that attract diverse audiences and facilitate different information needs and access. In addition to the most interesting research, the paper itseld includes some interactive PDF features inherently picking up the topic of interactivity in its own presentation. 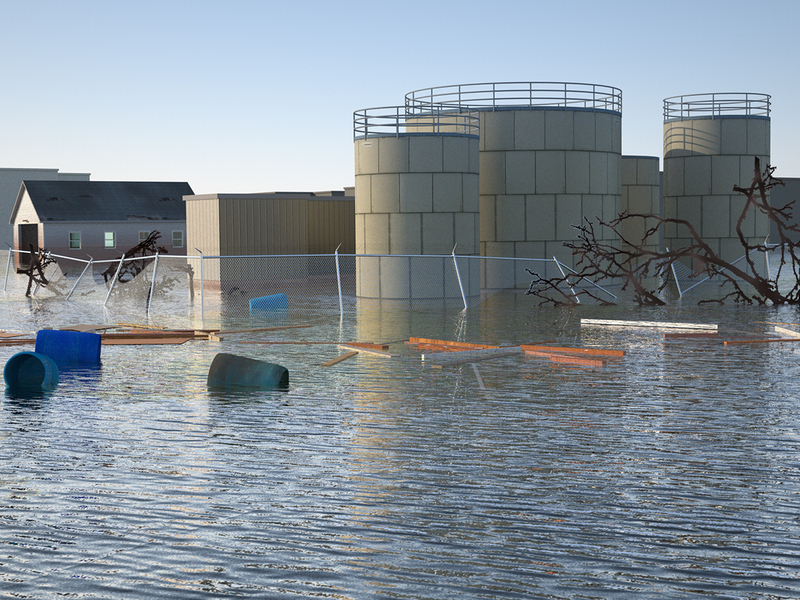 In his dissertation, Peter Stempel at the University of Rhode Island has done outstanding research about the ways in which realism used in visualizations influences the perception of risk (see the figure above for an example). 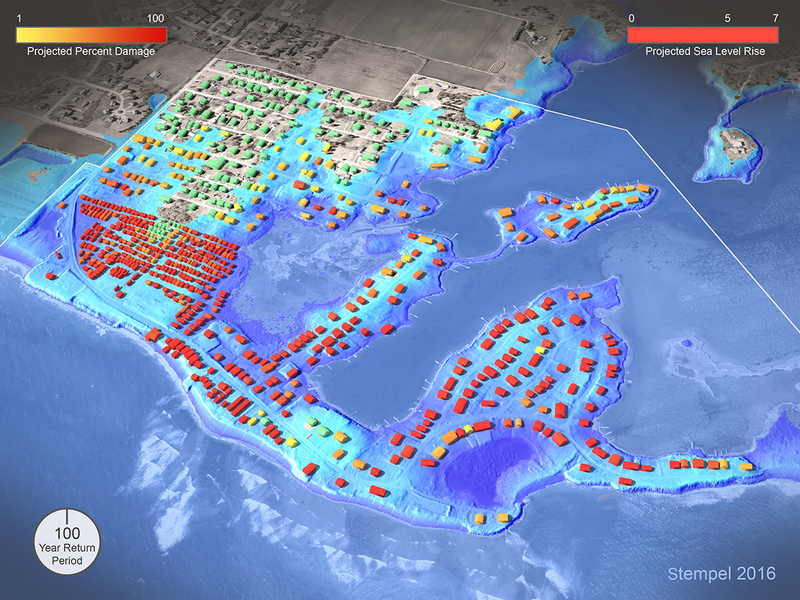 His particular focus has been on storm surges and sea level rise, continuing some of the work done by Prof. Stephen Sheppard, David Flanders, me and others at the Collaborative for Advanced Landscape Planning at UBC and published in Sheppard (2012) “Visualizing Climate Change”. Now, the University has created a position for someone to participate in and continue the work Peter has begun. This position is a fully funded assistantship focused on visualization (PhD). Rhode Island University are actively recruiting applicants. Contact regarding the PhD position should go to Dr. Austin Becker abecker@uri.edu, and Dr. Peter Stempel peter_stempel@uri.edu. 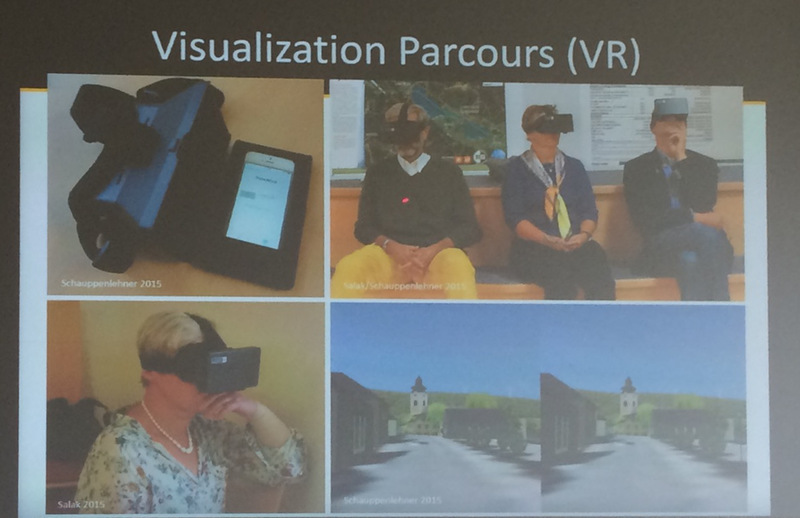 In this fully open access paper, Michael Getzner, Barbara Faerber and Claudia Yamu compare 2D versus (stereoscopic) 3D landscape visualisations of different landscape scenarios in the Alps. Although there have been previous studies of landscape visualizations of alpine scenarios, I found that this paper is adding a couple of particularly new perspectives: a) the use of stereoscopic (anaglyph) visualisations and b) the link to the economic valuation of different landscapes through the participants. It should be said that this study like many others was conducted with students. However, I think it provides the legitimization to use landscape visualisations for other studies on the economic valuation of such landscapes. This is the first issue of the new Journal of Digital Landscape Architecture. JoDLA addresses all aspects of digital technologies, applications, information, and knowledge bases in research, education, and practice pertaining to landscape architecture and related fields. 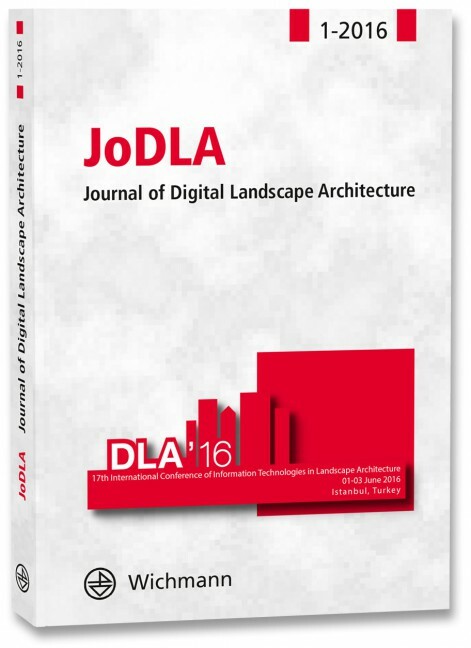 The journal publishes original papers that address theoretical and practical issues, innovative developments, methods, applications, findings, and case studies that are drawn primarily from work presented at the annual international Digital Landscape Architecture conference. Its intent is to encourage the broad dissemination of these ideas, innovations, and practices.